Each of the topics presented in this website and map tool have been carefully defined. The explanation of each is given here. In the main body of this page, the topics are in the order in which they appear in a Comprehensive Report on a species; the index is in alphabetical order. The definitions (in order of decreasing conservation concern) used by the International Union for the Conservation of Nature are: Critically Endangered (CR), Endangered (EN), Vulnerable (VU), Near Threatened (NT), Least Concern (LC) and Data Deficient (DD). Some species accepted by the IOU (particularly the southern ocean (Imperial) shag complex (Phalacrocorax atriceps), here treated as Leucocarbo spp.) are not recognized by BirdLife, and are thus not evaluated by the IUCN as to Red List status. We denote these species as Not Evaluated (NE) in this category. The best available information is provided; sometimes this is only a minimum or only a maximum. These figures are for all individuals of the species, and include immature individuals; the mature breeding population is therefore usually lower than the figure provided. Birdlife International and the IUCN also have regional/national estimates for some species which may be of additional use. The population trend is given as increasing, decreasing, stable, or unknown. Diurnal: When in marine environments, this species forages only during daylight hours. Nocturnal: When in marine environments, this species is known to forage during the night. At high latitudes this time is typically defined by the time that the sun is below the horizon, and is characterized by hours of reduced light levels even if it is not fully dark (see e.g. Grémillet et al. 2005). Diurnal, Nocturnal or Nocturnal, Diurnal: The species may forage day or night; the main foraging time is listed first. 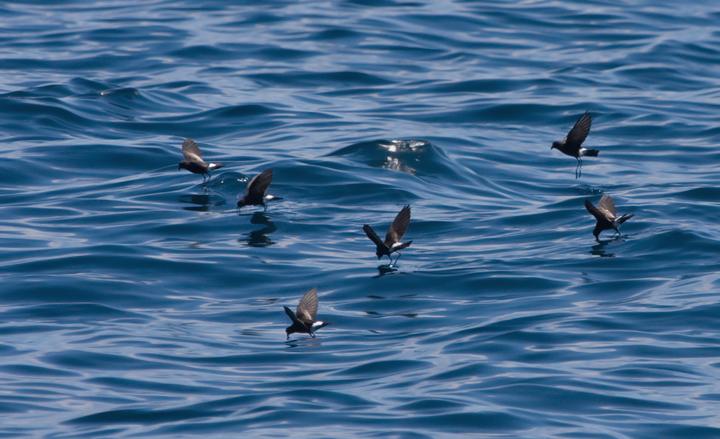 A surface feeder: Wilson's Storm Petrel Oceanites oceanicus. Photo by Bill Hubick. Yes: This species is known to feed by floating on the surface and feeding from this position, or this species forages from on the wing, retrieving food items at, or just under, the surface (surface seizing). This includes behaviors known as upending, dabbling, hydroplaning, dipping, and pattering. No: Indicates this species is not known to obtain its food sources at or near the surface of the water. Yes: This species is known to forage on the ocean floor or other bottom substrate. No: This species is not known to forage in or around ocean floor substrates. Yes: This species is known to follow in the wake of vessels as a regular practice, including non-fishing vessels (transports or recreational vessels). No: This species is not known to regularly follow vessels. Unknown: It is unrecorded whether or not this species follows vessels. Not a diving species: This species is unable and/or unknown to submerge itself under the sea surface to forage. Examples: frigatebirds, some gulls, some albatross. A diver is a species that fully submerges itself by any or all of the diving methods. Surface Diver: This species is known to mostly or fully submerge itself for foraging purposes, but only in very shallow, brief bouts. Examples: some gulls, shearwaters, and albatrosses. Diver, plunge: This species is known to fully submerge itself under the sea surface during foraging activities, sometimes for extended periods, and does so by entering the water from the wing. Examples: gannets and boobies. Diver, pursuit: This species is known to fully submerge itself under the sea surface during foraging activities, sometimes for extended periods, and to actively pursue its mobile prey while it is submerged; includes pursuit-plunging species. Examples: loons, penguins, cormorants, and alcids. Unknown: There is no information on diving for the species. These are often very poorly known species such as the Pseudobulweria species, or Bryan’s Shearwater Puffinus bryani. If a species is not a diver, its diving depth will be shown as "not applicable." Depth (Range): The range in meters (m) of most dives undertaken by the species for foraging purposes. The figure may be derived from the integration of several sources depending on their presentation of the information. Sometimes only a maximum depth is known for a species (especially information obtained from capillary tube studies) and if this is the case, then the range is given as surface to maximum depth. Max Diving Depth: The deepest dive on record for the species. If there is no explicit study of the maximum dive for a species, the deepest figure from the known range is presented. This is a list of species or groups of species that the seabird has been documented to consume. Emphasis is put on the species consumed in the marine environment, and where possible, the principal items have been listed first. It should be noted that this information is often drawn from pellet studies, and simply by virtue of the method’s nature, many invertebrate species in an animal’s diet may be unaccounted for. Gregarious divers: Blue-footed Boobies Sula nebouxii plunge-diving with Brown Pelican Pelecanus occidentalis. Photo by Greg Hormel. Many species may sometimes be found in groups of various sizes or alone. If more than one, the main type of social groupings for the species are listed first. Gregarious: Occurs in large groups from tens to hundreds of individuals. Small groups: Occurs in groups of a few to tens of individuals. Unknown: Social groupings have not been documented. Yes: indicates that the species nests in terrestrial situations near marine or estuarine environments, including oceanic islands (even if nesting in non-marine environments on those oceanic islands). This includes species that breed well inland or at elevation on oceanic islands. Therefore, for these species newly fledged young leave the nest site directly for the marine environment. No: indicates that the species nests in terrestrial situations not associated with marine or estuarine environments, and the young spend some time in these non-marine situations. Yes: Indicates that the species nests in groups with conspecifics and/or other species on oceanic islands or in other marine/estuarine environments. No: Indicates that the species is not found in groups of conspecifics or other like species, and the nest is usually isolated from others of its species. Yes: Indicates that the species has records in the World Seabird Colony Register. No: Indicates that the species does not currently have records in the register. Yes: Indicates that the species has records in the Tracking Ocean Wanderers/Seabird Tracking Database. No: Indicates that the species does not currently have records in the database. We have erred on the side of extending the species’ likelihood to be encountered in the marine environment, and consider the movement of the species as a whole. That is, onshore months represent the period when the majority of the species is occupying terrestrial habitats, not first arrival and last departure dates. Even in fully migratory species, some non-breeding individuals may stay on non-breeding grounds while the majority of the population has displaced to the breeding grounds. With respect to the exodus period (following pair formation and before egg-laying/incubation; this is particularly common in petrels) or desertion (extended parental absence during chick-rearing), note that unless this period is longer than one month, it is not taken into consideration in this schematic. Onshore: This is the period during which the species is likely to be found in terrestrial environments, whether islands or continents. Some species, for example loons and ducks, may breed inland on freshwater lakes, and are therefore not susceptible to marine fishing during that period. However, there may be individuals (i.e. non-breeding) of a population that do not follow these tendencies, and the months reflect the general movement of the mature, breeding population. If a species is shown present onshore year-round, this may reflect that onshore breeding habits/dates vary by region, or that individuals may be found on land at any time during the year. Inshore: This is the period during which the species is likely to be found in coastal and estuarine environments, whether around islands or continents, usually within 3-5 km of shore. For ice-edge associated species (e.g. Ross’s Gull, Snow Petrel) the ice edge is considered to be the ‘’shore.’’ Some species that may otherwise be found on the high seas may remain inshore during the nesting period. 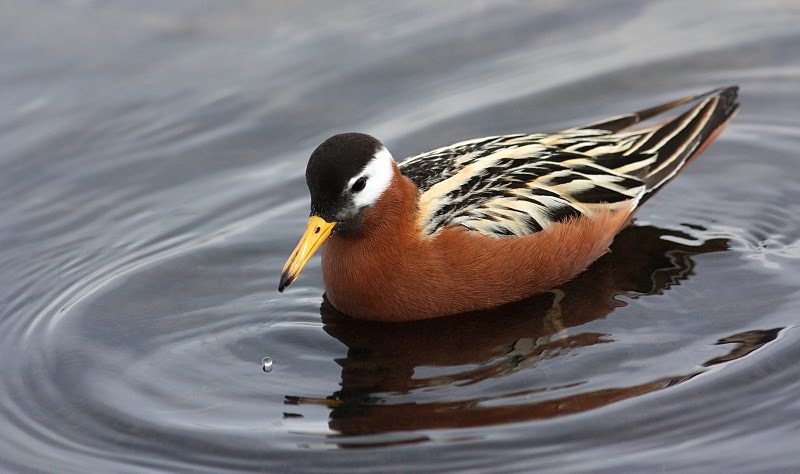 A species that is absent from the marine environment during the boreal summer months: the Red Phalarope Phalaropus fulicarius nests in wet tundra areas. Photo by Jay McGowan. Offshore: This is the period during which the species is likely to be found over open ocean environments, at least 5 km oceanward from the nearest land. No: This species is known not to make use of the described environment. Occasional: This species is sometimes but not regularly seen in the described environment. Unusual: This species has been known to occur in the described environment, but not commonly. Unknown: This species' use of this environment is either poorly known or not recorded. These notes may provide additional information, and especially may point to specific references, which may be found in the "Ecology References" section near the end of the report. Note that a species may have been caught or killed in fishing gear, but the bycatch has never been documented. Therefore, use caution; bycatch not having been documented does not mean it does not occur. It is especially important to be precautionary for species whose population is small and therefore for which any bycatch can be significant, whether documented or not. Undocumented: No bycatch or mortality has been reported. Yes: Bycatch has been reported for the species in at least one type of gear. If bycatch is documented (that is, "yes" is reported above), then one or more checkboxes in the table in this section may be marked. If bycatch has been documented but no gear checkboxes are marked, then an interaction was reported, but the gear type was not indicated in the report or it was not possible to determine in which type of gear. The latter sometimes occurs when bycatch is being reported in a fishery that uses more than one type of gear. For gear type definitions, see Gear Classification. These notes may provide additional information, and may point to specific references, which may be found in the "Gear References" section at the end of the report. Note that these references are those specifically about interactions with gear. This section contains what information we have been able to find on protected status of each species. Therefore, users should be aware that the information is very likely incomplete; many protection regulations or documents have likely been overlooked. This is especially true for countries in which the main language is not a Romance language. For many Asian countries especially, the legal and regulatory documents have not been translated into English, French, Spanish, or Portuguese, and therefore we have not been able to understand and include them. If no protected status is given here, or if no protected status is given in a particular country or region, this does not mean that the species has no protected status in that country or region. In addition, some nations have blanket protections for all species but do not specify any particular species; these are also often overlooked. Users should confirm the protected status for themselves. Country or Regional Body: If the protected status is given by a nation, the country name is given. In some cases, protected status is conferred through international agreements or treaties (such as ACAP). Regulation: This is the particular law or act under which the protected status is listed. Protected Category: This is the category of protection, because many countries give different levels of protection to different species, such as "Endangered" or "Threatened." Notes: The notes may clarify the protected status.